Pitching to win – do you have the right proposition? It’s all very well honing how you’re going to pitch your proposition to prospective customers, but have you stopped to think whether you’re putting the cart before the horse? What about the proposition itself? Is it the best you can do with your resources and capabilities? Is it what the market and your customers actually want? We all know how fast markets are changing and how customer expectations and buying behaviour has been transformed by the internet over the past decade. So how does your proposition reflect that? Do you need new products, do you need to re-brand, do you need to innovate or try to disrupt the market? For any business to succeed, it needs firm foundations. The right market, right products and proposition, right routes to market and the right competitive strategy. But how do you know if you’ve got these in place? Here are a couple of tools you can use to help you find out before you’re put on the spot in a pitch situation. The first is the well-established Boston Matrix. This focuses on your existing products and propositions and considers them in terms of the return they are making or could make to the business. It visualises a cycle tracing products from the early stage called ‘Problem Child’ where they are effectively at the level of R&D, through the stages of ‘Star’, ‘Cash Cow’ and eventually ‘Dog’, when little or no profit is being made. Understanding the cycle and how to position your current propositions within it is a very useful exercise. The top right quadrant is the home for your new and probably troublesome ideas; new products, services and solutions. If you are thinking of using off-shore delivery for the first time, this would be a good candidate for the “Problem Child” category. The top left quadrant is where the really good ideas have evolved into valuable offerings; high value, high margin, little competition. Invest in it as long as it lasts because in most cases, changing market sentiment and increasing competition will eventually drive your Stars into the Cash Cow quadrant. This is no issue as you should by now have got back all the start-up investment, made a very good surplus return and you now have a robust offering that “sells itself”. The thing to beware of is the move to the final quadrant, “Dog”. The term, as used in US business speak, means the things in this quadrant are no longer of any real value to the business. They may be producing low returns or be troublesome to maintain as relevant skills are in short supply. They may even start to damage your brand reputation. So it might be time to withdraw the product or sell it off. 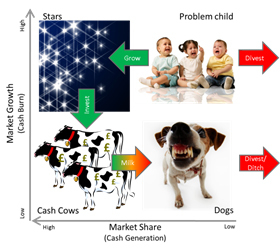 The two quadrants that are really of interest are Star and Cash Cow. Troubled Child is the feeder to them and Dog is the exit door so focus your energies on the other two. Star will typically produce high margins while cash cow will be steady dependable revenue. But with a little lateral thinking, it’s entirely possible that in a different market a Dog can again become a valuable contributor and a Cash Cow may become a Star. The Ansoff Matrix compliments the Boston because it provides a disciplined foundation for the process of thinking required to explore options for product, proposition and market. It enables you to look at your existing and potentially new products and propositions and how they might map to your current and potential new markets. 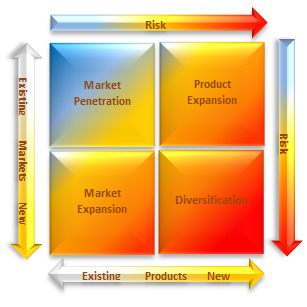 Market penetrationusing your established offerings in your established markets. On the face of it this is the most predictable and lowest risk strategy. However, doing nothing different brings its own risks, such as growth slowing due to market saturation, commoditisation leading to downward pressure on margins, and the risk from new agile competitors. Surveys typically show this strategy being the major source of revenue for most companies – something over 80% across most industries, a figure that typically increases during times of economic strife. If this is where you plan to focus, a rational review and analysis of your current position can be facilitated through the Boston Matrix described above. Product expansion with a new offering to established markets. Approaching established markets and customers with a new offering is the least risky option for trying something new. Established customers will be easier to sell to than new prospects and will probably be more forgiving if there are issues with the new offering. But they may well extract special terms as they are functioning as guinea pigs. Market expansion by taking your established offering to new markets. If you have plenty of experience of selling and delivering your proposition in established markets, the risks of expanding those markets aren’t great. The main risk comes from a potential lack of understanding of the workings of the new market. So your assumptions, goals and targets will need to be reviewed regularly whilst you learn the new market and how your offering now fits. Diversification with a new offering to new markets. This could be the result of you developing something new or by taking on an agency or re-seller arrangement for a new solution. If it is something you have developed then you will have the knowledge and experience gained from that process. If the new offering is something you have taken on, then your knowledge of the offering is at its weakest compared to all the other scenarios. In summary, using the Boston and Ansoff tools provides a disciplined and structured way for you to brainstorm to understand your current position and to explore the options. It is always good to have fresh eyes when undertaking such a review, so include your; non-execs, your ACE chair, ACE colleagues or other trusted external parties in the brainstorm! Now is not the time to be frightened of change and using the above tools will help to bring clarity to your decision-making process. Phil Shipperlee is co-founder and CEO of Performative, where he combines his knowledge of sales and selling with his extensive practical business experience to help other people to grow their businesses and transform their sales performance.